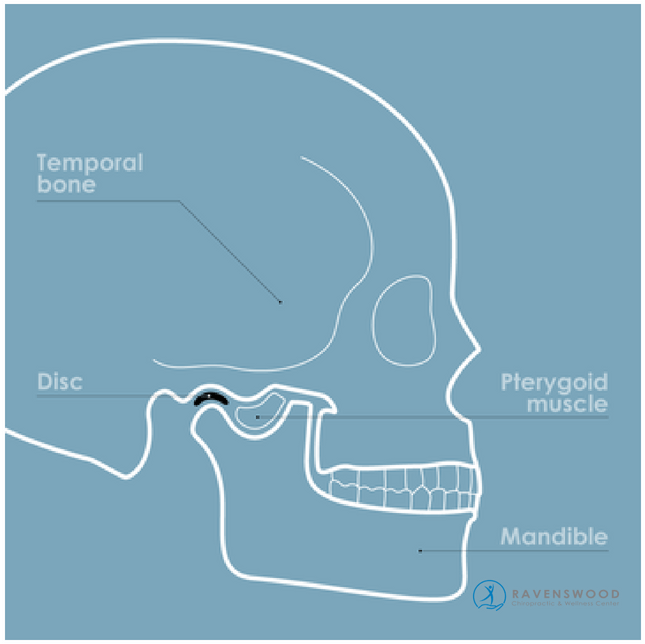 WHAT IS TEMPOROMANDIBULAR JOINT DISORDER (TMJD)? The National Institute of Dental and Craniofacial Research, a division of the National Institutes of Health, estimates that TMJ disorders affect over 10 million Americans (or 5-15%). The term TMJ is commonly misused to refer to TMJ disorders, the TMJ itself is a part of the human anatomy; it is a part of the jaw known as the temporomandibular joint. It is a joint between two bones that consists of soft cartilage covering the attachment points of each bone (mandible and skull) with a gel-like disk between them acting as a shock absorber. As the TMJ makes two motions in one – a sliding or gliding motion in addition to a hinging action – it is one of the more complex joints in the body. When you consider how often it is used, it is also one of the joints most prone to damage. TMJ disorders (sometimes seen written as Temporomandibular Disorders – TMD or Temporomandibular Joint Disorders – TMJD) involve problems with the TMJ itself, the jaw, or the surrounding facial muscles. Both joints or only one may be affected by a TMJ disorder. WHAT CAN CAUSE JAW PAIN? Intra-articular causes which are causes that originate in and of the temporomandibular joint itself. Extra-articular causes which originate outside the temporomandibular joint but have an indirect effect and cause pain. Intra-articular Causes of TMJ Pain or Causes of TMJ pain arising from the Temporomandibular Joint itself. • Synovitis: inflammation of a synovial membrane. Extra-articular Causes of TMJ Pain or Causes of TMJ pain from outside the Temporomandibular Joint. * Cartilage on the ends of the bones getting damaged by impact or disease. TMJ disorders can impact a person’s ability to eat (including chewing and swallowing), to speak, or make facial expressions. And in extreme cases, they can impede on one’s ability to breathe. The TMJ is the joint, or pair of joints, on the side of the head, one on each side, in front of the ears where the lower jawbone (or mandible) attaches to the bone that makes up the side skull (the temporal bone). Together, these two joints are the “hinges” that allow us to yawn, chew, and even talk. A joint between the two bones consists of soft cartilage covering the attachment points of each bone with a gel-like disc between them acting as a shock absorber. As the TMJ makes two motions in one – a sliding or a gliding motion in addition to a hinging action – it is one of the more complex joints in the body, and especially when you consider how often it is used, also one of the joints most prone to damage. TMJ Disorders should be evaluated by a qualified healthcare professional who specializes in jaw pain. A chiropractic physician is an excellent choice since a chiropractor can accurately diagnose TMJ disorders and provide a course of personalized treatment to help alleviate the painful symptoms associated with it. Chiropractors are uniquely able to treat TMJD because there is such an intricate relationship between neck and jaw function that in many cases both need treatment to get best results. In some cases, an X-ray or MRI may be necessary for providing a definitive determination as to which cause of the TMJ disorder needs to be addressed. • When did the symptoms start? • How severe is the pain from 1 to 10? • Where does it hurt the most? Your chiropractic physician may ask you to open and close your mouth while listening, feeling, and observing the jaw. Your chiropractic physician may press on or around the temporomandibular joint to pinpoint the areas of discomfort, swelling, and pain. Here at Ravenswood Chiropractic & Wellness Center, we provide pain reducing treatment options and then we work with you to resolve the underlying issue. We believe that conservative, non-invasive, and non-medicative management for patients should be the first line of treatment. We are experts at diagnosing and treating temporomandibular joint disorders, and we can help relieve pain associated with the condition. We can correct the central cause of the temporomandibular joint disorder and help to prevent damage and future occurrences. Our conservative care options offer safe and effective alternatives to prescription drugs and surgery. 1) Reduce pain and restore activities of daily living. Chiropractic is a safe and natural method for treating a temporomandibular joint disorder. At Ravenswood Chiropractic & Wellness Center, we can offer several different treatment options. Using a gentle, non-invasive adjustment technique, your chiropractic physician can help to improve the range of motion of the temporomandibular joint. This will help to alleviate pressure, reduce pain, and prevent further injury. For some patients, TMJ disorder is a result of a stressful lifestyle and shows itself in the grinding or pressing of the teeth while sleeping. For these patients, we include stress reduction as a component of their treatment plan. Carefully prescribed physical therapy when performed at the right time during treatment is an effective way to treat temporomandibular joint disorders but only if you have been appropriately diagnosed by a physician. Do not begin physical therapy exercises until you know what the cause of your TMJ disorder is as these exercises could make it worse if not used correctly. Common treatments in physical therapy for temporomandibular joint disorders include passive and active therapies. Massage therapy may also be helpful in the treatment of temporomandibular joint disorders, primarily when used in conjunction with other therapies such as chiropractic, physical therapy, and acupuncture. At Ravenswood Chiropractic and Wellness, your clinical massage therapist will assess your condition and consult with the chiropractic physician to recommend a personalized treatment plan for you. Many of our patients with TMJ disorders have responded particularly well to myofascial release massage therapy. Massage therapy involves the deliberate manipulation of muscle tissue to alleviate adhesions while restoring length-tension relationships. Your massage therapist may focus on your back, shoulders, neck, and head to help reduce tension in these muscles as they might be contributing to your TMJ pain. Massage therapy can increase flexibility and range of motion, which may alleviate the painful TMJ disorder symptoms during talking and chewing. What’s more, massage therapy has also been shown to be useful in helping the body heal after invasive procedures for TMJ disorder. TMJ disorder and bruxism can be caused by mental as well as physical stress. Acupuncture has the unique ability to address both of these issues simultaneously, making it an ideal solution for TMJ disorders. Because acupuncture is a holistic therapy, it does not treat physical and emotional symptoms separately but views them as being closely interrelated. Over time, it is possible that extreme emotions can lead to problems in the physical body and vice versa. TMJ disorder is a prime example of this as symptoms will often flare up during stressful periods. Acupuncture works by placing fine needles at specific points on the body to relieve pain and other symptoms. It does this in some different ways. Firstly, it triggers the release of chemicals known as endorphins in your brain. These are your body’s natural painkillers, but they also promote relaxation and a sense of general well-being which can help to reduce stress. Aside from this, acupuncture works to reduce joint inflammation and hypersensitivity while calming the trigeminal nerve. There would also be a focus on relaxing the muscles involved to relieve tension and pain. If you are prone to TMJ pain, it is a good idea to see an acupuncturist as a preventative measure to reduce the risk of flare-ups. This is especially important after dental work, car accidents or any physical impact that could aggravate the problem. These preventative treatments would aim to keep the joint in good shape, reduce stress levels, prevent teeth grinding, clenched jaw and neck and shoulder tightness. If you are having a flare-up, acupuncture can also help. It can calm the pain and swelling while relaxing the muscles and relieving stress. In traditional Chinese medicine, the condition of TMJ disorder is not uncommon. It is often accompanied by other symptoms such as IBS, insomnia, tinnitus, reduced libido, migraines, high blood pressure, and anxiety. These are symptoms which are often induced by increased emotional stress. Because acupuncture treats the body and mind together, it can help with all of these issues should they occur. By promoting relaxation and improving the health of the joint, it ultimately helps to reduce the instances and severity of your TMJD. Temporomandibular joint disorders are common, and they can be an extremely painful condition, limiting what we can do, eat, or say. Luckily, there are plenty of treatment options available. Conservative treatment options such as chiropractic adjustments, physical therapy, massage, and acupuncture offer a natural and safer alternative to harmful medications and unnecessary surgeries. Why not start with natural, non-invasive treatments? If you believe your symptoms are from temporomandibular joint disorders, please call Ravenswood Chiropractic & Wellness Center at 773.878.7330 (Monday through Saturday) to set up your initial exam or request an appointment on-line. We understand the impact TMJ disorders can have on your day-to-day activities and that is why we accommodate same-day appointments for jaw pain. Your only one phone call away from starting down the path toward relief! 1. Pavia S, Fischer R, Roy R. Chiropractic Treatment of Temporomandibular Dysfunction: A Retrospective Case Series. Journal of Chiropractic Medicine. 2015;14(4):279-284. doi:10.1016/j.jcm.2015.08.005. 2. Devocht JW1, Long CR, Zeitler DL, Schaeffer W. Chiropractic treatment of temporomandibular disorders using the activator adjusting instrument: a prospective case series. J Manipulative Physiol Ther. 2003 Sep;26(7):421-5. 3. DeVocht JW, Goertz CM, Hondras MA, et al. A pilot study of a chiropractic intervention for management of chronic myofascial temporomandibular disorder. Journal of the American Dental Association (1939). 2013;144(10):1154-1163.